Ooh, speaking of books I've been looking forward to with an unholy yearning . 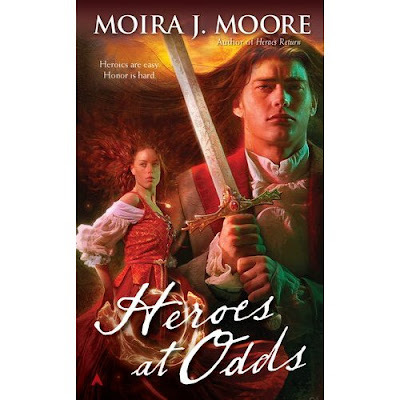 . . Moira J. Moore has just posted the cover for Heroes at Odds --the upcoming fifth installment in her most excellently wonderful Source & Shield series. And I have to say, this is my favorite cover since book three. It really is. Even if Taro is manfully gripping a sword. I like it, I love this series, and I cannot wait to get my hands on this book. Heroes at Odds is due out July 26th. Ah, I was wondering about the sword pose, too, but I've only read the first one so thought maybe I'd missed something. I'm hoping to read the second book soon - the first was an awful lot of fun! You mean Taro doesn't have blue lightning shooting from his fingertips anymore? Dang. Thanks for this, Angie! I needed some good news today. Thanks for posting this. The cover is definitely better than the last two, but I still think the series deserves more. I'm with KarenS, I still thinks the covers of this series don't do it justice. Yay! A respectable cover! And is that a bench-dancing Lee I spy? Very nice. Thanks for the post, Angie. I've received an email from the editor with a copy of the cover attached, and it's easier to see. So, no, not bench dancing, though it would have been nice to see that. Also, the glowy thing next to Lee's chest is a necklace. Which isn't plot relevant. I don't care about any of the oddities or inaccuracies. I'm too relieved to have a pretty cover. Hello there. My name's Naomi and I've been searching everywhere for a discussion board for this book since I don't know anyone who reads this series. By the way, aren't the covers absolutely dreadful? They always make me cringe, especially the male model. Wished they had kept to the original covers. In any case, I wanted to ask a question to those of you who have already read it so *major spoiler ahead*! I know it was probably her fatigue and stress along with working so hard with magic but we never did find out why exactly she was so sick during the bit where the house was bombarded with light balls. Lee seems more tired and sickly and she kept questioning herself over why she's so emotional. Now my question is if anyone else picked up on this and wonder if she's pregnant or is this just my imagination? Also, does anyone have a theory as to why the marriage ceremony went so badly, why fate or maybe the energy of the land didn't want them to marry? I'll keep looking back here regularly to see if anyone's replied!